AMDA alumna Tyne Daly returns to Broadway this coming March—in a musical, once again. And as a domineering mother, once again. It Shoulda Been You, directed by Tony Award-winner David Hyde Pierce, is scheduled to open April 14, 2015, at the Brooks Atkinson Theatre. 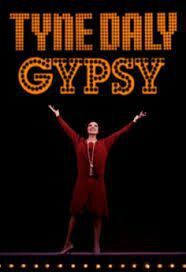 Gypsy marked Daly's last musical on Broadway, garnering her a 1990 Tony Award for her portrayal of Mama Rose, the stage mother to end all stage mothers. In between then and now, Daly has performed in four Broadway plays: The Seagull, Rabbit Hole (Tony nomination), Master Class and Mothers and Sons. It Shoulda Been You is billed as follows: "In a world where nothing is what it seems, religions collide, Machiavellian plots are revealed, promises broken, secrets exposed, and hope springs from the most unlikely of places. Is it the latest conflict in the Middle East? No, it’s just the Steinberg wedding." Daly will play what Variety described as “the Jewish mother to end all Jewish mothers,” reprising the role she performed at the George Street Playhouse in 2011. We look forward to seeing her next offering this coming spring.